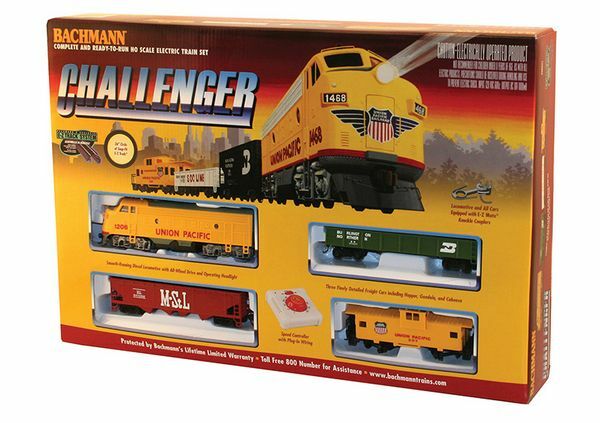 Bachmann 00621 The Challenger HO Scale Electric Train Set by Bachmann Trains. This is BA00621 The Challenger HO Scale Electric Train Set by Bachmann Trains. E-Z Track® snap-fit track (with steel rail) and roadbed system: eleven 18" radius curved, one 18" radius curved terminal rerailer. An EMD F9 Union Pacific diesel engine with operating headlight. A Union Pacific Wide Vision Caboose.